Although it last aired in August of 2016, the My Last Days TV show has not been cancelled. The CW has announced the long-awaited second season of My Last Days premieres on Friday, May 25, 2018 at 8:00pm. Season two of the docu-series consists of three episodes, and airs on Friday nights through June 8th. From Justin Baldoni, My Last Days follows people who are living with terminal illnesses. The new installment on The CW features five new individuals who are willing to share what time they have left, in hopes of making the world a better place. Although the following press release refers to “season three,” that seems to be a typo. This is the second installment (which it also says), and the episode numbers indicate this is season two. May 18, 2018 (Burbank, CA) – MY LAST DAYS, an uplifting documentary series about life as told by courageous people living with a terminal illness, will return for its second installment as a three-night special event, Friday, May 25 (8:00-9:00pm ET/PT), Friday, June 1 (8:00-9:00pm ET/PT), and Friday, June 8 (8:00-9:00pm ET/PT), on The CW. 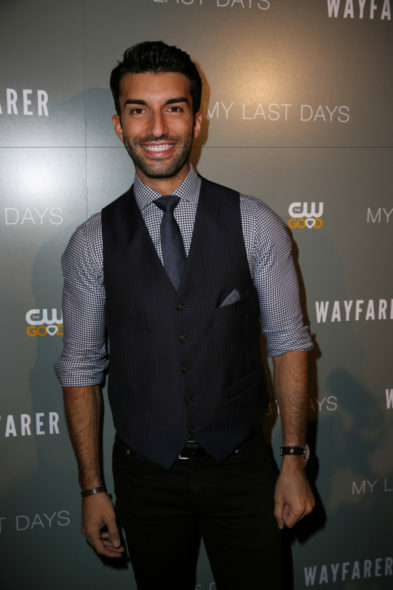 Created by and featuring JANE THE VIRGIN star Justin Baldoni, season three of MY LAST DAYS features the compelling stories of five courageous individuals, who remind us that having a limited amount of time doesn’t mean we can’t make a positive impact on the world. · Marinda Davis is a choreographer and master teacher dedicated to opening hearts and breaking barriers through dance. Struggling since childhood with a range of unidentified health issues, Marinda was diagnosed with seven autoimmune diseases and told that she wouldn’t live past the age of forty. But Marinda is much more than the sum of her illnesses. A dancer from the moment she tried on her first pair of ballet slippers, she’s danced professionally for Sting and 98 Degrees, and choreographed for some of the top studios and schools around the world. And while Marinda can’t physically dance anymore, she’s channeled her passion into a spectacular contemporary dance show entitled UNbreakable. Loosely based on the Kübler-Ross model of the five stages of grief, UNbreakable tells the story of Marinda’s emotional and physical journey with illness, and highlights the resilience of the human spirit. · Anthony Carbajal is a passionate street photographer who’s now unable to even lift his camera. Diagnosed with ALS at twenty-six, Anthony learned that the nerve cells in his brain and spinal cord were slowly dying and would eventually resulting in complete paralysis. But despite his diagnosis, Anthony was determined to find a way to keep enjoying his love of photography. With the help of friends and family, Anthony developed a unique mount on the armrest of his wheelchair that could enable him to take photos on the move, transforming his wheelchair from a symbol of his limitations into a way of connecting with people and destroying social boundaries. In 2013, Anthony made a YouTube video for the ALS Ice Bucket Challenge that went viral overnight with 17 million views, resulting in over six million dollars being donated in his name to ALS research. At his core, Anthony believes that while ALS is stealing his strength, it’s not stealing his happiness, a sentiment he loves sharing with his family, friends and subjects in front of the lens. · Bob Charland is a real life superhero with a heart of gold. At forty-four years old, Bob’s living with a neurodegenerative brain disease caused by injuries he sustained working a second job as a bouncer and bodyguard. And while Bob’s days are numbered, all he wants to do is give back to the community that’s always supported him. Soon after his terminal diagnosis, Bob started Pedal Thru Youth, a non-profit that fixes old bicycles and donates them to underprivileged youth. An auto mechanic for the past twenty years, Bob personally restores bicycles late into the evening after his day job, tightening wheels, adjusting seats and positioning handlebars. What started as a passion project has mushroomed into a community phenomenon, resulting in hundreds of bicycles donated, even earning Bob the nickname “The Bike Guy.” Bob’s ultimate goal is to promote positivity in the lives children by encouraging them to put down their phones, leave the couch, and get outside. · Ellie Boloori Oben is a mother, and community leader who was diagnosed with breast cancer in 2012. As a lifelong Baha’i, Ellie took solace in her faith as the disease progressed, believing cancer was a reminder that the impermanence of life is what truly gives it meaning. Ellie met her illness with the same fighting spirit she carried throughout her life, with only one goal in mind – living as long as possible so she could be there for her young son Jalen, the light of her life. After being given only two weeks to live, Ellie’s final wish was to host a celebration of life so she could surround herself with friends and family and say goodbye with a smile. Ellie’s ultimate hope is that all people can live happily, joyfully, and kindly. · Diane Nguyen is a twenty-six year old turtle aficionado whose quirky sense of humor and tenacity for life have given her the strength to surpass every doctor’s prognosis. Living in Arizona with her husband, Long, and two turtles, Mac and Cheese, Diane was diagnosed with terminal leukemia in 2012 and given only eight months to live. But instead of worrying about what may be to come, Diane has focused on positivity and humor, seeking to transform something ugly into something beautiful. Diane is all about celebrating the little moments that matter most, and cherishing every minute she has left with the love of her life. THE CW TELEVISION NETWORK launched in 2006 as America’s fifth broadcast network, with programming targeting younger viewers, a demographic highly sought after by advertisers. The CW, a joint venture between Warner Bros. Entertainment and CBS Corporation, will broadcast a six-night, twelve-hour primetime line-up, Sunday through Friday, beginning in Fall 2018. The CW’s primetime programming is also available to stream for free, without authentication, on the ad-supported cwtv.com and The CW app, now available on every major OTT platform. In daytime, The CW broadcasts a Monday through Friday afternoon block and a three-hour Saturday morning kids block. The CW’s digital network CW Seed launched in 2013 and offers original short-form digital content as well as past seasons of fan-favorite television series. What do you think? Did you watch the first season of the My Last Days TV series on The CW? Do you plan to return for season two? More about: Jane the Virgin, Jane the Virgin: canceled or renewed?, My Last Days, My Last Days: canceled or renewed?, The CW TV shows: canceled or renewed?